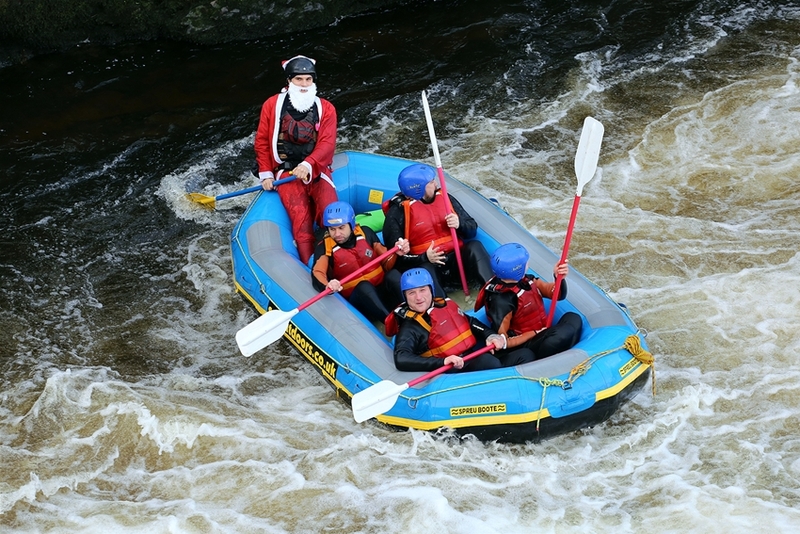 Come along and try Whitewater Rafting here in Llangollen, North Wales where we raft the fantastic River Dee. A 4.5km section of fun with lots of adrenaline-filled fun for all the family. Come and see what its all about! Stuck for a gift? Buy Vouchers Here! Minimum group size is 4 people if you are booking for 2 or 3 please call the office to check availability. This is one of the best whitewater rivers in the UK. Your session starts at our centre in Llangollen where you will meet your guide and be given all your equipment. Following an individual safety briefing you are ready to head out onto the rapids. 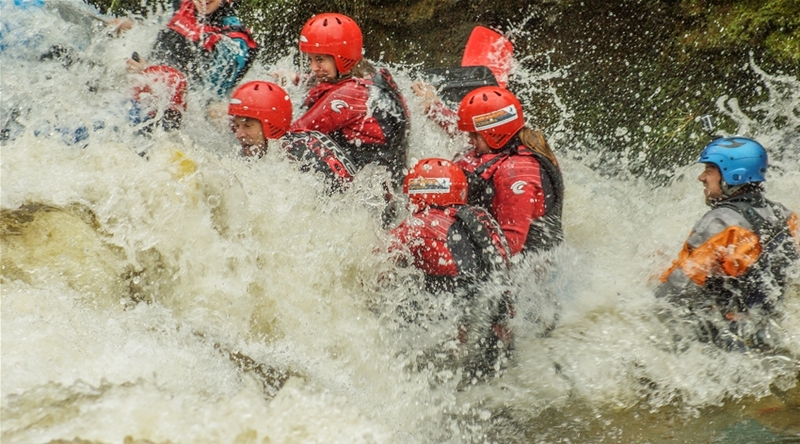 As you travel down the river you will not only encounter beautiful scenery but a number of exciting rapids including the famous Serpents Tail and Town Falls in Llangollen. Don't forget to tell family and friends to come and watch you from the bridge in Llangollen. Your session will last for approx 2 1/2 hours. Summer session times (March onwards): 9.30am, 10.15am, 1.30pm, 2.15pm. Winter session times (October onwards): 9.30am and 1.30pm. We require 4 people to run a session, if you are booking for less please check that we have a session running by calling the office. £58pp including all equipment and instruction. We are currently offering 10% discount on all bookings for Sundays booked online. 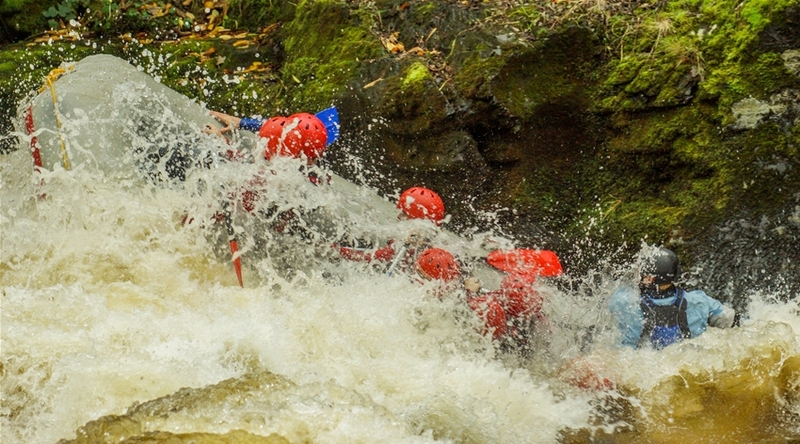 Raft the Lower Treweryn, a fantastic section of Grade 3 river with lots of exciting whitewater sections to finish at Bala Mill Falls. Price: £58pp Numerous dates available. Call now to book!!! How many people are in a raft? Each raft holds 6 people. If your group is less than 6 then there will be other people in your raft. Whats included? : We provide all equipment and instruction. Do I need to pay in full? : We are happy to take a 25% deposit to secure a booking to give you a chance to get money from people. If the booking is for 4 weeks in advance or less we do require full payment. What do I need? : You need to wear trainers and bring a towel, swimwear and a change of clothes. What times do you do it? : See above for times. What is the maximum group size? We can take up to 48 people in one session. Do I need to be able to swim? : You do need to be water confident. What if the river is too big? : At certain times of the year the river comes up and we are unable to run rafting sessions. During these times we will arrange an alternative activity or re book you for a later date. Do you give refunds for cancelling? : If we cancel for safety reasons you will receive a full refund. If you cancel then please refer to our terms and conditions for our refund policy. We provide a wide range of Outdoor Activities to suit everyone and we're always ready to offer you a warm welcome! Situated in Llangollen, North Wales, we offer activities to suit everyone, so whether you are an individual or part of a group we can easily tailor activities to suit your needs.